Contributed by Joe Theisen, age 13. Katniss Everdeen is headed back into the Hunger Games for the second time. She will have to figure out how to keep herself alive while also focusing on her main goal of keeping her fellow District 12 partner Peeta alive. She has been transported to District 13 after the bombings in 12 was destroyed her home. Katniss is still the center attention to the Capitol and not just because of the poisonous berries she threatened to eat in the first book of the trilogy The Hunger Games. She will have to decide to help either the emerging rebels or the falling Capitol and President Snow. Suzanne Collins is a very diverse yet detailed writer, her books range from her most popular trilogy the Hunger games to the unspoken kids book The Year of The Jungle. 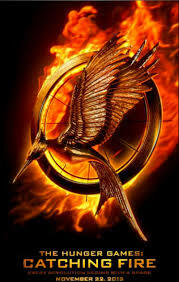 I think that Catching Fire is the best of all, but closely followed by Hunger Games and Mockingjay. Hello, my name is Joe, I am thirteen years old I enjoy playing basketball and baseball. And I love to play outside with my dog. "Rarely does a resident of any of the world's great metropolitan areas pause to consider the complexity of urban life or the myriad systems that operate round the clock to support it," from The Works: Anatomy of A City. Kate Asher's book is for anyone who marvels at urban planning -- and has experienced the best and worst of it. Her focus is on New York City and it's unique infrastructure, but the details will foster an appreciation for any great city and the things we take for granted. Starting with transportation, both people and freight, she moves through how the utilities, communication networks and the most fascinating topics of water, sewer and garbage. The latest edition was published before the havoc of Hurricane Sandy, but you will still be impressed with this encyclopedia of knowledge. Learn about the pneumatic tube that used to move mail around Manhattan, the vacuum car that runs along the subway lines to pick up garbage, or what the future holds for adapting and running systems long into the future. With great graphics and bite-size pieces of information this book belongs on your coffee table for all to enjoy. Kate Ascher worked at the Port Authority of New York and New Jersey. She was executive vice president of the New York City Economic Development Corporation when the book was first published.